The San Emigdio Mountains are a part of the Transverse Ranges in Southern California, extending from Interstate 5 at Lebec and Gorman on the east to Highway 33–166 on the west. 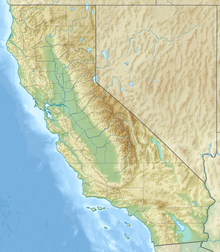 They link the Tehachapis and Temblor Range and form the southern wall of the San Joaquin Valley. The range is named after Emygdius, an early Christian martyr. The range is within Kern County. The highest point is Frazier Mountain at 8,017 feet (2,444 m). As with most of the Transverse Ranges, the mountains generally lie in an east-west direction. Towns or settlements near the San Emigdio Mountains include Frazier Park, Lake of the Woods, and Pine Mountain Club. ^ "San Emigdio Mountains". Geographic Names Information System. United States Geological Survey. Retrieved 2009-05-04. ^ "San Emigdio Mountain". Geographic Names Information System. United States Geological Survey. Retrieved 2009-05-04. ^ "Tecuya Mountain". Geographic Names Information System. United States Geological Survey. Retrieved 2009-05-04. ^ "Escapula Peak". Geographic Names Information System. United States Geological Survey. Retrieved 2009-05-04. ^ "Brush Mountain". Geographic Names Information System. United States Geological Survey. Retrieved 2009-05-04. ^ "Antimony Peak". Geographic Names Information System. United States Geological Survey. Retrieved 2009-05-04. ^ "Eagle Rest Peak". Geographic Names Information System. United States Geological Survey. Retrieved 2009-05-04.